The family took a quick four day ski trip, only two days of which were actually spent skiing. The rest of the time we were chasing storms and trying to avoid the Northwest's infamous rain. The first day was spent at White Pass. Despite its reputation as a small, easy mountain, we didn't find it to be the case. 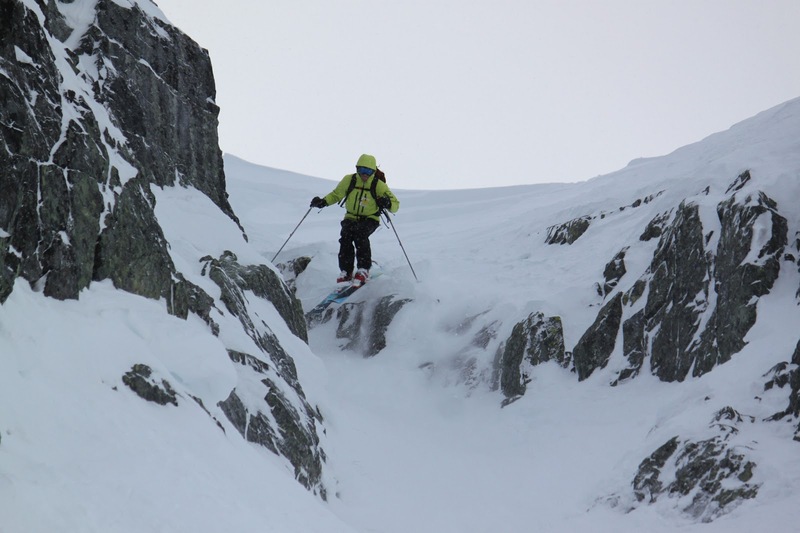 Yes, the runs are generally flat and wide open, but anyone who tells you it's not an expert mountain is either lying or they cannot ski trees and cliffs. to either side of the main lift are steep, densely treed areas which we found to be chock full of unskied powder. Midway through this section is a 15'-30' high cliff band, with few notches. A little creativity was needed to get through the band (hitting the cliffs is particularly risky due to the densely treed landings), but there are occasional chutes that can be down-climbed (or straight-lined if you're particularly brave). No useable pictures were taken this day. The next two days were spent driving and resting in Whistler Village, an opportunity I have never previously been fortunate enough to have. We got up at 4:00 to be near the front of the line for Fresh Tracks tickets. 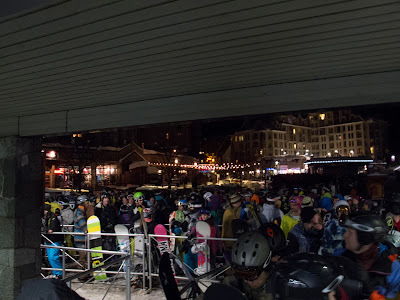 Arriving at the Whistler Gondola at 5:10 A.M., we were 6th, 7th, and 8th in line. Next a two and a half our wait. The enormous line at 7:00 A.M. Soon we were at the lodge up high on the mountain, shovelling in food as fast as possible. Fifteen minutes before the lines were set to drop we were standing outside, skis on and ready to go. When they released us, my brother skated ahead of everyone, getting first tracks at Whistler on a day with 50cm new snow. Not bad...until we skied the snow. 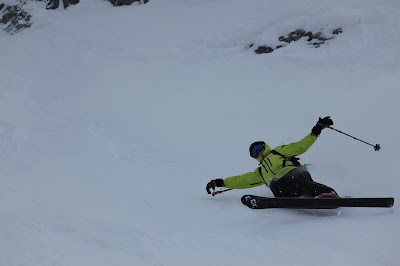 It was deep, very deep, but also very heavy. We did laps on the flatter lift until Harmony Chair was opened. The father skiing below the cliff band on near Harmony Chair. Eyeing a narrow (5' wide) chute in the cliff band between Low Roll and Kaleidoscope from Harmony, we went to check it out. 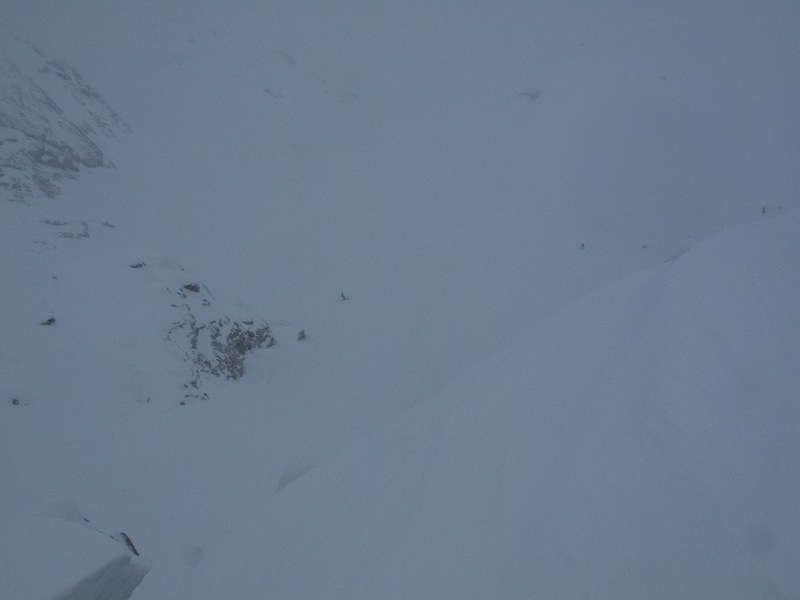 Finding the entrance from above, when it's hard to tell if you are standing on a cornice, a cliff, or just a really steep roll, is difficult, but after a little guesswork, we found the top. It had been bombed as was pretty hard, but skiable. It'd have to be a straightline to the wide bowl beneath. Turning above the rock band while contemplating the large drop to the bowl below. This run was pushing my abilities, I'll admit, but I had a plan. 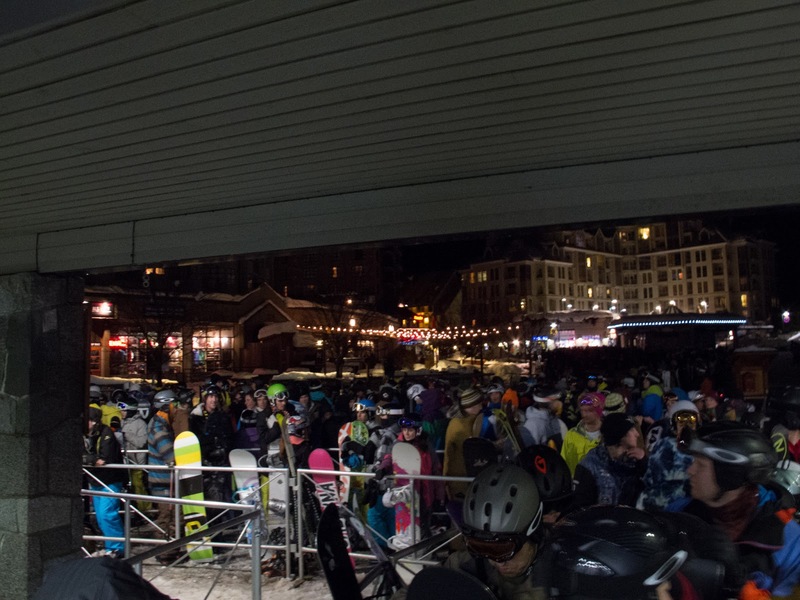 Turn down until on top of the rock band, jump off the 4' drop, make it down the chute and then carve a nice slash in the broad powder slope below. Making it to the top of the rock band was easy enough, and I knew that once I dropped in it would all happen quickly. The drop went well and I was on my feet. Having raced for quite some time, I have a good feel for speed. Thirty and forty mph passed before I setup for the turn. Dropping in for the turn at 45 mph. 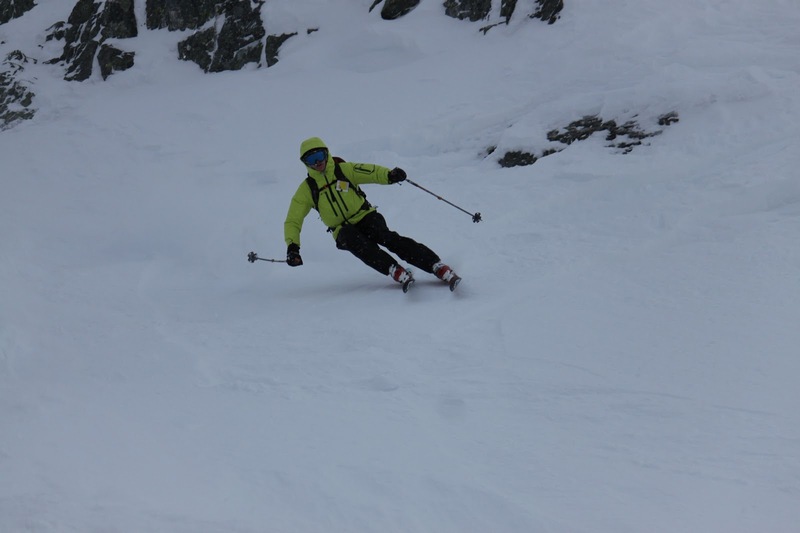 That smooth powder slope turned out to be wind blow crust and at 45mph I was not breaking through. Anticipating soft snow I was in the back seat. Half a second later I was falling. Mid fall and traveling fast. I washed out completely, snow filling my jacket and my arms flailing. Right in front of the lift. I was fortunate enough that the fall ended without a yard sale and as my speed decreased, I rolled over to my feet, snow sifting out of my goggles and helmet. If you're not falling, you're not trying hard enough. We skied Harmony until it was skied out and then moved to Symphony. The snow was still thick. At the end of the day, we headed up to the peak. 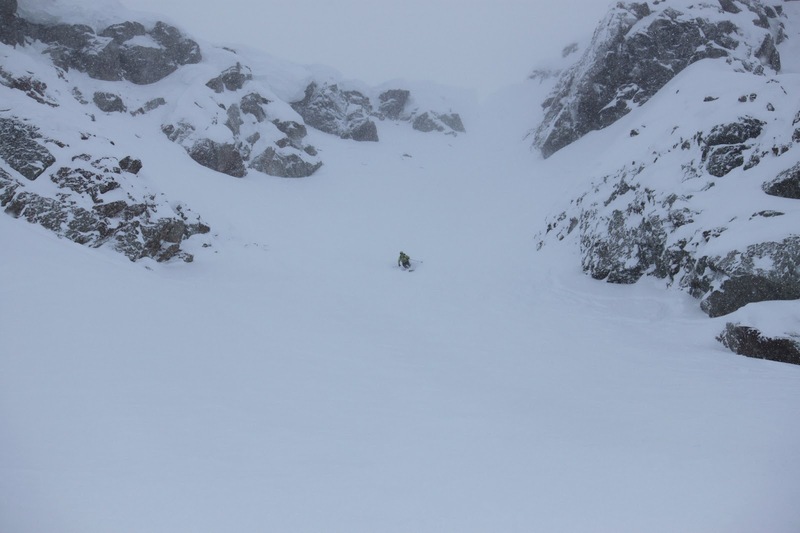 One of my favorite runs on Whistler is The Couloir because of its challenging entry and easy, but great skiing, due to the fact that many people can't handle the entrance. Signs at the beginning of the run. A little hyperbolic, perhaps. The view from the top. Can you spot the two skiers? 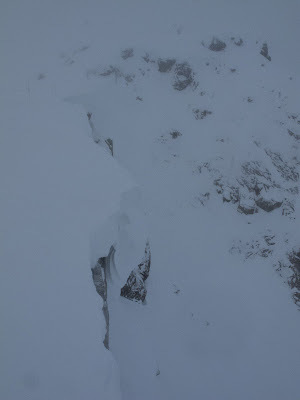 The cornice drop for the very brave from the entrance. To the right is a very large cliff. 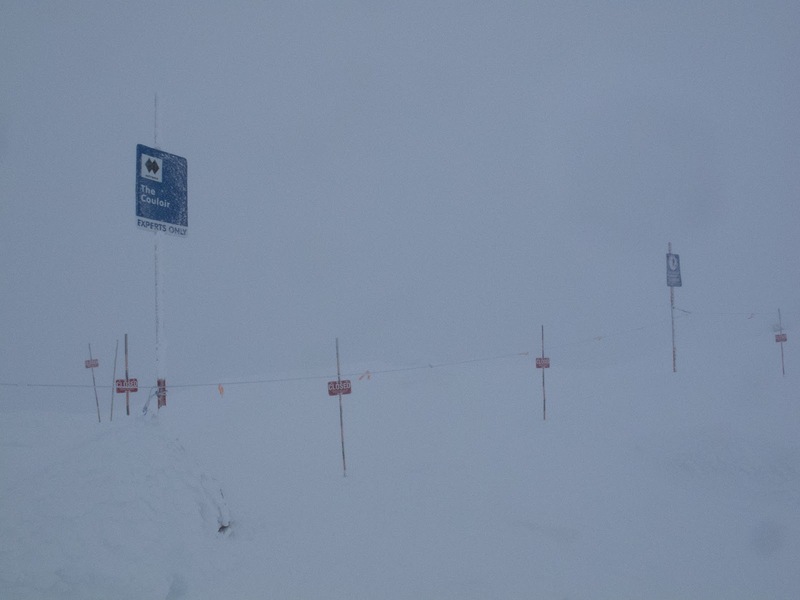 Standing at the entrance, a hidden ramp extends skier's left. The size of the cornice/cliff is more evident in this photo. 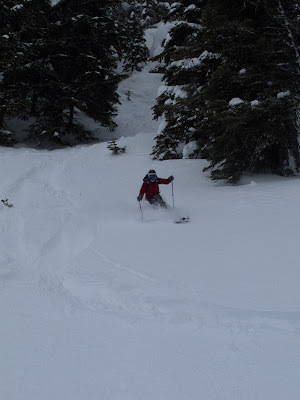 Midway down the chute in fresh powder. Once through the entrance I spotted one other track. 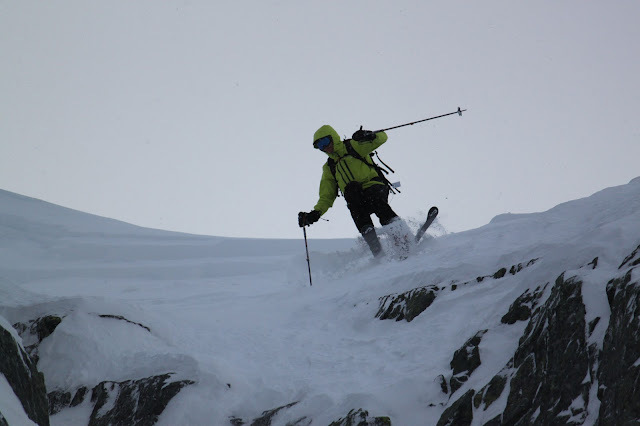 Either the snow had drifted in many tracks, or I was the second person to ski it that busy day. 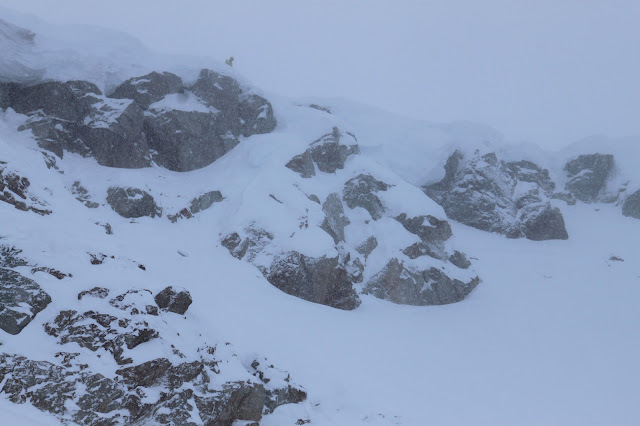 The powder was nearly untouched save for the avalanche line coming from the blasting location. A great end to the trip.